I’ve never been taught a choke that goes through the face. It doesn’t always have to end in a submission. Know what your opponent is about. If he’s being defensive, why should I be defensive too? I want to recover my position and then mount my offence. That’s considered as good as any submission; you’ve gone from a bad position to a better one. Essentially, there are no short cuts and Marc highlights the importance of following the steps and getting each aspect of the technique right before proceeding to the next step. This applies to grander concepts such as ‘position, control, submission’ as well as to the nitty gritty of angle, grip, timing and etc of each technique. These positions and drills were worked in isolation, but Marc asserted that the goal was to transition between these positions and options in response to the opponent’s counters. 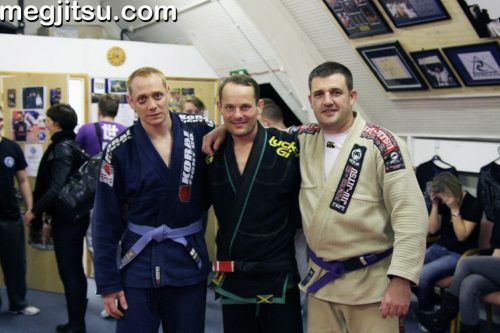 The evening ending with 4 of the guys levelling up their belts and no review of mine of a Marc Walder seminar would be complete without a shout out to those that made the leap. 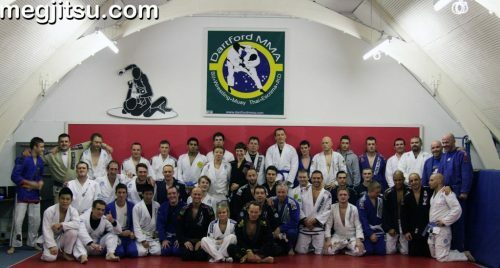 We’ve got 3 new blue belts rocking Dartford BJJ! The guys have worked hard through injury, aches and pains and the regular beatings that come with the territory to really raise their games; well done to Gareth, Marc and Steve! 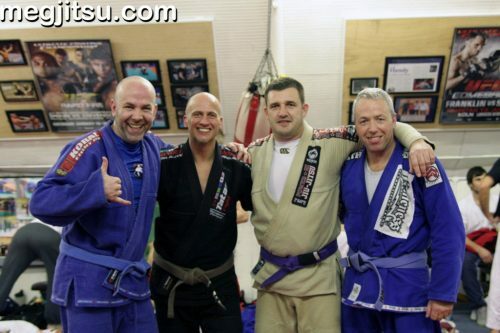 We’ve also got a new purple belt in our ranks and it was a real pleasure to see ‘Big’ Lee Ranson be promoted. I’ve had the pleasure of training with Lee for many years, well some of those early years weren’t quite so pleasant, but over the past couple of years Lee’s gone through a massive change. He’s a big man, as his moniker suggests and could be a bit of a bruiser, but these days he’s much more interested in testing his technique even if it opens him up to attack from shrimpy opponents and in helping others to learn; it is terrifically fun to roll with him! Big congrats, Lee, represent! Thanks to Danny and Kate at the Academy for the use of the pictures.